From 25.2.2008 to Friday 29.2.2008, the Dagstuhl Seminar 08091 "Logic and Probability for Scene Interpretation" was held in the International Conference and Research Center (IBFI), Schloss Dagstuhl. During the seminar, several participants presented their current research, and ongoing work and open problems were discussed. Abstracts of the presentations given during the seminar as well as abstracts of seminar results and ideas are put together in this paper. Links to extended abstracts or full papers are provided, if available. The program consisted of 21 talks and discussions, attended by 40 participants from 12 countries. In accordance with the interdisciplinary nature of the workshop topic, the attendants represented distinct streams in Computer Vision, AI and Cognitive Science, in particular High-level Computer Vision, Logical Models in AI, Probabilistic Models in AI, Robotics, Multimedia Content Representation, and Cognitive Models. The main goal of the workshop "to advance the use of logic-based knowledge representation and reasoning for scene interpretation (static and dynamic scenes), and explore possible ways for reconciling logics with probabilistic models" has been reached in several respects. However, unanswered questions and unsolved problems by far outnumbered definite answers to the questions with which the workshop has started. Here are some of these open questions:Are there a priori roles for logics and probabilities in scene interpretation? What is the proper semantics for peobabilities in scene interpretation? 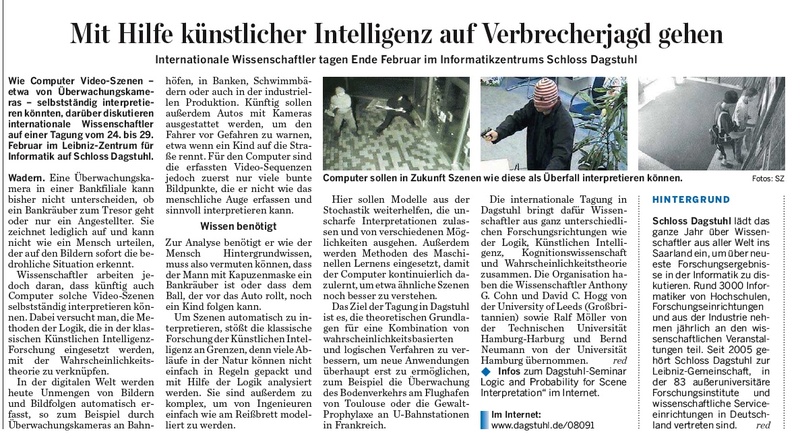 What is the impact of high-level and common sense knowledge in scene interpretation?What are the consequences of logics and probabilities for a scene interpretation system architecture?Thanks to the professional and friendly people of the Dagstuhl organisation! Many of the participants hope to convene again in Dagstuhl for discussions of a similar topic. In der Reihe Dagstuhl Reports werden alle Dagstuhl-Seminare und Dagstuhl-Perspektiven-Workshops dokumentiert. Die Organisatoren stellen zusammen mit dem Collector des Seminars einen Bericht zusammen, der die Beiträge der Autoren zusammenfasst und um eine Zusammenfassung ergänzt. Es besteht weiterhin die Möglichkeit, eine umfassende Kollektion begutachteter Arbeiten in der Reihe Dagstuhl Follow-Ups zu publizieren. Ihrem Seminar entsteht. Derartige Veröffentlichungen werden von uns in der Rubrik Dagstuhl's Impact separat aufgelistet und im Erdgeschoss der Bibliothek präsentiert.